This is a Thread where you can ask Ted questions concerning your build. My main body upper piece is 1" L200 and my lower half is 1" upholstery foam. I am attaching my backpack rig and the PVC frame inside both half- I was going to use zip ties for the L200 portion (for both the backpack rig and PVC frame) but for the bottom half - which is upholstery foam I was going to do the canvas method you spoke about yesterday. What is your feeling? Could I use zip ties for the lower portion? Glueing the strap material sounded like a good option as well. Tom, the zip ties will be fine on the top L200 portion. But the upholstery foam isn't strong enough for that. You'll have to reinforce with muslin or canvas. This isn't really a question so much for Ted, as maybe for Chris or someone; is there a way to get access to the chat discussions that go on during class? sometimes there are links in there and people mention resources that once I close the page, I've lost. Now for one for Ted; instead of spandex as the undercloth for the neck, can I just use any sort of stretchy or semi-stretchy material? James, You can use anything you want as long as you feel it has the stretch you need. I just happen to always use spandex. It's also at times called milskin. We by it in such bulk, 50 to 100 yrds at a time, in the shop and it's relitivly inexpensive at about $13. per yard. James if you look they are saved to the my documents section of your hard drive by default. Ted, I am having trouble piecing this together in my head. My character is wearing tight pants in the end product. Do I cover the foam in spandex underneath and again with the clothing? Also, with my characters bare arms and with your characters naked parts, do I cover in spandex and then cover in wet foam, or seal with spray glue? Also, are you gonna use a unitard on yours? I'm thinking I'm not going to because there's so much space between me and the outside that it would be pointless, seems the same with yours. Maybe in the arms only? We haven't covered coverings yet, but we talked a bit about spandex. I'm wondering how I'm going to cover this to give it a rhino look. I'm thinking leave the stomach, gloves and head and wet foam those, but spandex the rest and stipple liquid latex on it or something. I think Ted said things that are going to be covered with clothes we cover with spandex. Hands, feet, heads will be wet foam or latex'd over (not covered in Spandex). There are 2 reasons for covering foam with Spandex- one so that clothes and other foam pieces to be able to "glide" over one another with ease. If you take two pieces of foam and try to pass one over another they catch. The second is to "smooth out" the foam form underneath. Even if you mistakenly cover a portion of your character with spandex you can still texture over it. Hello all. COVERING IN SPANDEX. If your character has clothing... cover those areas with spandex that will be covered with clothes. If your character is made of L-200... Cover with spandex. But only if you intend to do wet foam. Or if you're going to use an other textured fabric as you final skin. If you are going to texture with upholstery foam (as i did with the T-Rex) you do not need to cover with spandex. Spandex will need to span moving areas such as James rhino neck or Troy's slug creature neck. I hope this makes sense to you all. We'll go over this more on Saturday as well. Okay, so should we mainly have the body peices done but not connected by saturday? 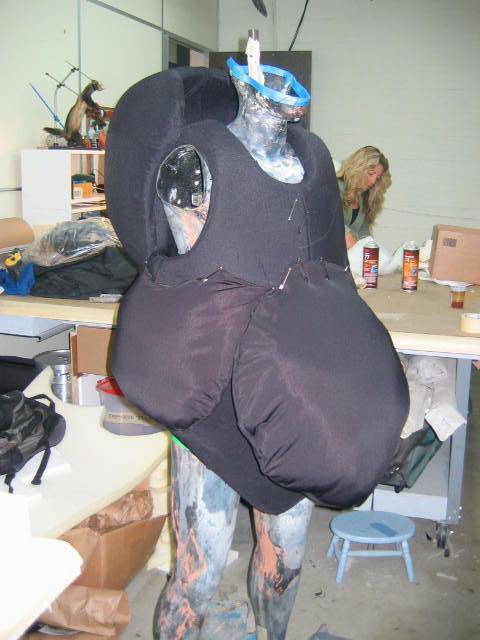 Also, you said I should do the body in upholstery, but I'm not sure how I'm going to get a stiff armor look with that. Would I cover in Slip latex spray? Yes, the body in upholstery foam. But then your character, if I remember, has a costume and your armor pieces will go over that... Yes? And I would make the armor pieces out of L200. If you don't have L200, you can do them with upholstery foam. Can't I just use straight L200? The upper body armor covers that whole area and then I was thinking of attaching to the bottom half (upholstery foam) by putting an inside lip that would join top and bottom. I plan to cover that joined area with a belt. Or I could just have the l200 overlap the bottom half and attach the outside of the bottom to the inside of the top. Make sense? Yes, if the whole upper body is a suit of armor, then use L200. I thought that there were armor pieces over wardrobe. I think I'm going to have to just deal with some of the issues these guys want, unless I want to make two suits, which is entirely possible. The character needs to have rhino skin all over as some shots will be with a shirt off (getting a check up from the doctor, jogging on the treadmill, etc) but be dressed in a business shirt and tie for some other shots. Those shots with the shirt I think we will just have to be careful how we shoot because the clothes won't glide over the textured surface, as you say. Anywho, also wondering how to attach the spandex to the head without covering the whole head in the material. I know you will cover this later, but can I spray glue the section where the spandex neck will meet the head and hide the joint under wet foam texture? Sure, spray glue or a barge like glue would work fine adhering the spandex. The removable under shirt is a great idea. It doesn't have to be spandex. Maybe just a very large but altered under shirt. Sorry ladies, that was inappropriate. Thanks for the clarification, Ted. Hi Ted. I remember you were talking before about making a body pod before, and I was looking at the Chef Boyardee photos of yours- so should I make a body pod like that? Like a chest piece and torso piece, and then bulk it out with the stomach etc? I attached my plan there of how I should fit into the suit. You got it Ciara! I was confused when I saw my work at first But yes, that's very close to how I would build yours. Oh yeah I put in that photo to make sure we were talking about the same thing. Thanks, I think it's starting to make sense in my head. Keep it Troy. Big heads are great. 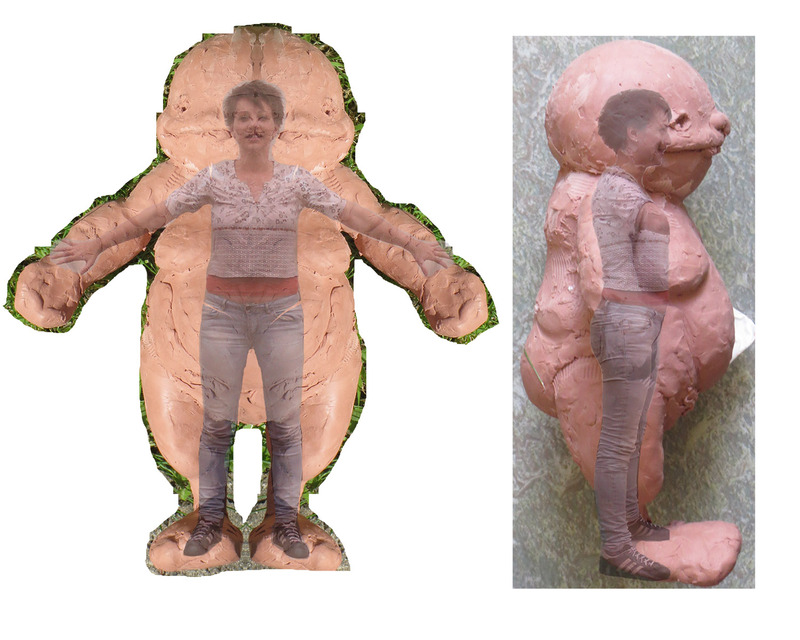 You could also texture the body a bit to match the bulk. Hey Troy, If you are performing with him- which it sounds like you are...then I would keep the head the size that it is. Having a bigger head is great for live stuff because everyone can see it better. If the weight is good and the movement doesn't suffer from the big noggin' than keep it the size it is. No one except us will know it is suppose to be smaller. No Troy, not at this stage. It's just something to keep in mind for the future. The head looks fantastic either way. Maybe just a little bulking up on the body would balance things out. But I wouldn't loose sleep over it. You can also compensate by maybe making the legs just a bit bigger/thicker than you would have. Just a thought.